Moreover, the lesson makes a repeated point that Jesus chose women to be the first witnesses of His resurrection, that He chose them “to be the first heralds of the Resurrection” (p. 81). It is not hard to conclude from this lesson that the author is making a case, without ever directly addressing the issue, that women’s ordination ought to be considered a valid move for the Adventist organization. 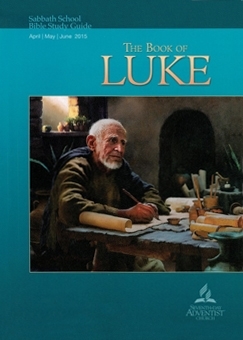 To make this point, the author refers to Jesus’ raising the son of the widow of Nain as recounted Luke 7. The point is made that touching a dead body, as Jesus did when he touched the dead son, was “a ceremonial defilement” and refers to Numbers 19:11-13. It is nearly impossible to address Jesus’ profound ministry that led to His crucifixion and resurrection as long as we approach the gospels with a presupposition that Jesus came to be an example and to demonstrate what God is like. Jesus did not come to be an example. He came to be a sacrifice for human sin. The only way His life is an example is that he lived out submission and trust in His Father—and that “example” is not for humanity at large; it is only for those who have believed and have been born again. No natural man who :15:does not repent and receive Jesus’ blood as the payment for his sin can follow Jesus’ example. He did not come to show us how to live or to overcome sin. He came to die so we can be made alive. We are born spiritually dead, “by nature children of wrath” (Eph. 2:1-3). Dead people cannot please God; they can only repent and receive the forgiveness offered by the virtue of Jesus’ spilled blood. When they believe that Jesus is the God-Man who bore their personal sins in His body so they can “become the righteousness of God in Him” (2 Cor. 5:21), they are born again of the Spirit and sealed with the Holy Spirit of promise (Jn. 3:3-6, Eph. 1:13-14). As long as one supposes he can be a “Christ-follower” by emulating Jesus’ example, he remains dead in sin and misses the only way to the Father. Jesus did not come to show us how to live. He came to die for us. Jesus, as the substitute and sacrifice for sin, was the promised Messiah. Jesus came as God incarnate, and the way He revealed His identity was through the signs He performed in fulfillments of the messianic prophecies. When Jesus healed the dead and healed the incurable afflictions of those around Him, as in the case of the woman with the issue of blood, He was not demonstrating that compassion was more important that ritual. In Judaism, those ritual laws were moral requirements. To break a ritual law was to sin, and any Jew who touched a bleeding woman or a dead body or lepers was unclean and had to go through a strictly prescribed ritual cleansing. Jesus’ deliberate breaking of these ritual laws was not to show that doing good was greater than rituals. Rather, Jesus was demonstrating that He was the Messiah. He was demonstrating that those rituals were pointing to Him. Only Jesus had the Life and the righteousness and the power to bring cleansing to an unclean woman or man. When Jesus touched an unclean person, He did not become defiled. On the contrary, He imparted cleansing to the unclean. When Jesus touched a dead body, He did not become defiled by it. Rather, He gave life to the dead. His power as God the Son granted cleansing and life to those who were cut off from their people and from temple worship. He restored them to life and to community by His own innate power. Jesus was not demonstrating that Jews needed to let their compassion be stronger than their commitment to rituals. On the contrary, their commitment to rituals was God-ordained and demanded, and if they broke the rituals, they had to offer sacrifices and go through cleansing. It was God’s demand of them. Jesus was showing that He was the One the prophets promised. He was making the lame walk, the blind see, the sick well, and the dead were brought to life. This was no example; this was FULFILLMENT! Jesus was fulfilling the rituals that always pointed to Him. Only the Messiah would be able to break the ritual laws without sin and defilement, because only the Messiah would undo the curses of the law that isolated the sick and the dead. Jesus touched the dead without uncleanness because He had the power to reverse death. Jesus was Lord of all, even of the rituals and the unclean. Only He had the power to render the rituals worthless. In Jesus was release from all the curse of ritual uncleanness. Only in Jesus. The curse of sin meant that women would be dominated by their husbands; in Jesus, women receive equality in God’s eyes. Jesus’ treatment of women, again, was no “example”. Rather, He was redeeming millennia of suffering that women endured because the natural state of humanity is spiritual depravity which results in cruelty and self-centeredness. In Israel God provided for women in remarkable ways that set them apart from the women of the pagan nations. He made provisions for women to receive inheritances if there were no male heirs; He provided systems of justice and protection that kept them from being utter victims of rage or jealousy. Yet mankind was dead in sin, and women suffered a diminished role that made them virtual chattel. Moreover, children were even less in society than women. They were the most vulnerable and helpless of all, and they were victims of all manner of abuses and neglect throughout the history of the world. When Jesus came, He, being the Perfect Israel and the sinless Man who did not have to be born again because He was conceived by the Holy Spirit and was always spiritually alive as a man besides being God the Son, treated women with the respect and love of God. He was not demonstrating a new political or social norm concerning women; rather, He was living out the reality of God’s perspective. The fact that Jesus honored and redeemed women’s worth is not a demonstration of “equality” in role or service. He was not erasing the distinctions between men and women nor changing God’s divine roles. The lesson completely neglects the New Testament instructions for the role of men and women in marriage and for the biblical instructions for church leadership. Ephesians 5 describes husbands as the head of their wives as Christ is the head of the church. They are to love their wives sacrificially as Jesus loves the church as He creates for Himself a spotless church through His own sacrificial life and death. Wives, on the other hand, are to submit to their husbands as to the Lord. There is a biblical model of authority and role. These roles do not mean women have less value or capability; they simply mean God established a way we are to relate. At the same time, 1 Timothy and Titus establish that church leadership is composed of godly men who lead their families well. Moreover, while it is true that many women were disciples of Jesus and that He appointed women to be the first witnesses of His resurrection, His apostles were all men, and it was only to them that He gave the actual leadership of the church. That being said, Jesus did more than give women a mandate to work in the church. What He did for women was far more profound. Women were the least in society besides children and slaves. In the first century when Jesus was here, women were not considered reliable witnesses and could not even appear as witnesses in court if they had actually seen an event that was being tried. Their word was considered completely unreliable. Jesus deliberately entrusted significant events and revelation to the unlikeliest women. Besides making a handful of women the first witnesses of His resurrection, Jesus also committed some of the most profound theological insights of His ministry to women. Jesus said to her, “Woman, believe me, the hour is coming when neither on this mountain nor in Jerusalem will you worship the Father. You worship what you do not know; we worship what we know, for salvation is from the Jews. But the hour is coming, and is now here, when the true worshipers will worship the Father in spirit and truth, for the Father is seeking such people to worship him. God is spirit, and those who worship him must worship in spirit and truth.” The woman said to him, “I know that Messiah is coming (he who is called Christ). When he comes, he will tell us all things.” Jesus said to her, “I who speak to you am he” (Jn 4:21-26). Samaritans were unclean to Jews, and furthermore, Jewish men would never have private conversations with women. In this passage Jesus deliberately went into Samaritan territory, spoke to a disreputable women while his disciples were purchasing food, and told her that true worship had nothing at all to do with meeting in sacred spaces—or times. Created things are not sacred. Rather, true worshipers worship “in spirit and in truth”. Jesus clearly declared that humans have spirits that are separate from their bodies. God is spirit—not body—and humans have spirits that can worship God who is spirit. This truth is completely suppressed in Adventism, yet Jesus clearly articulated it. And He spoke these startling words to a woman who was also a Samaritan. Moreover, God placed this Samaritan woman and this singular revelation into His eternal word. For all eternity we will remember this unclean woman who believed that Jesus was the Messiah, and we will remember that Jesus entrusted her with one of the most central truths that undercuts the heresy that teaches man is only physical. Another amazing truth Jesus gave to a woman is found in John 11 when Jesus is approaching the tomb of Lazarus. This even occurred just days before His own crucifixion and resurrection. As he approached Bethany, Martha came to meet him. So when Martha heard that Jesus was coming, she went and met him, but Mary remained seated in the house. Martha said to Jesus, “Lord, if you had been here, my brother would not have died. But even now I know that whatever you ask from God, God will give you.” Jesus said to her, “Your brother will rise again.” Martha said to him, “I know that he will rise again in the resurrection on the last day.” Jesus said to her, “I am the resurrection and the life. Whoever believes in me, though he die, yet shall he live, and everyone who lives and believes in me shall never die. Do you believe this?” She said to him, “Yes, Lord; I believe that you are the Christ, the Son of God, who is coming into the world” (Jn. 11:20-27). Again, God placed this story into His eternal word. For all eternity Martha will be remembered as the one to whom Jesus revealed that He IS the resurrection and the life. Moreover, He clearly stated to her that whoever believes in Him will live even if he dies, and those who believe in Him will never die. They have eternal life that does not end nor become interrupted by death. Jesus was clearly saying death does not stop a believers life! And He articulated this amazing reality to Martha. One of the most profound revelations Jesus made, He made to a woman who often became overwhelmed by life’s demands. And this same woman believed He was “the Christ, the Son of God”, the Messiah who was coming into the world! Jesus revealed in His dealings with women that women are called and chosen just as men are, and women are given faith to believe just as men are. What Jesus did for women was far greater than giving them social equality. He demonstrated that they were created in His image just as men are, and there is no distinction between men and women in their ability to believe and to understand who He is. Jesus’ sacrifice and resurrection restores to the least valued members of the human race the dignity of being recognized as God’s children and witnesses. The story of Elizabeth and Mary told in Luke 2 is far more than a demonstration that God made those women able to speak about Him. Rather, He entrusted His eternal, divine reputation with people who were not going to be considered valid witnesses. He wasn’t just saying, “Do as I do and give women the right to do the same jobs as men.” What He did was far more vulnerable. He entrusted some of the most unique and vital accounts of His true identity and of the reality of the gospel to people whom He KNEW would not be believed—except by other true believers. Jesus even gave the unborn John in Elizabeth’s womb a role in witnessing to His true identity. John leaped in his mother’s womb when Mary entered Elizabeth’s house. Jesus redeemed what men had done to the weakest and least valued in society and gave those people the honor of bearing unique witness of Him. What He did in entrusting His truth with women was the same as if we were to send out a convicted criminal with the most important news of the day—expectin g that people would believe. When people believe in Jesus, the accepted social customs are turned upside down. When we believe, we can no longer retain our value in education, financial security, or even good health. Those are wonderful blessings from God, but they have no part in our value or worth. In Jesus, the least of these is the greatest. Believing in Jesus and being born again reverses the natural order of life. We become citizens of a new kingdom (Col 1:13), and we are never the same. Copyright 2015 BibleStudiesForAdventists.com. All rights reserved. Revised April 27, 2015. This website is published by Life Assurance Ministries, Camp Verde, Arizona, USA, the publisher of Proclamation! Magazine. Contact email: BibleStudiesForAdventists@gmail.com.